John started training martial arts in 1989 at the age of 9. He began his journey with karate learning from the Blanco brothers (Ed and Augustus “Pee Wee” Blanco) and recently earned the title of Master (5th degree karate black belt) from Grandmaster Augustus Blanco. While in High school, he became intrigued with the ground game while wrestling on the Acadiana High Wrestling Team. 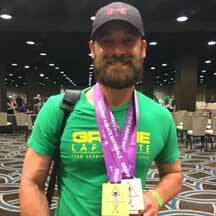 He expanded his grappling knowledge by taking Judo while attending the University of Louisiana at Lafayette, then graduating in 2001. He has competed and placed in numerous Karate, Wrestling, Judo and BJJ competitions. John has been training in Brazilian Jiu-Jitsu since 2006 and is a Brazilian Jiu-Jitsu Brown Belt under Professor Allen Hopkins and Mr. Steve Miller. He has been teaching martial arts for over 20 years and enjoys helping his students become the best versions of themselves by passing on the martial arts knowledge and life lessons that he has learned throughout the years. His true passion is sharing martial arts with everyone including his wife (Monica) and their two children. John and Monica have combined their devotion to Martial Arts and to each other by enjoying the Academy together. Couples that train together have an incredible bond, and this couple has shown that.